Passover 2015 begins in the evening of Friday, April 3 and ends in the evening of Saturday, April 11. There are a multitude of restaurants in Los Angeles that are celebrating Passover dinner and seder service. Here are some great places to enjoy the holiday with your family and friends. 1. Petrossian Executive chef Giselle Wellman is preparing special dishes for Passover including savory Matzah Brei served with traditional milk-soaked matzo sautéed with mushrooms and onions, and finished with 20 grams of caviar. 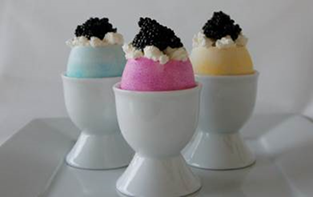 It’s served in a colored egg. It is available from Friday, April 3 through Saturday, April 11, and will also be available on the weekend brunch menu through the end of April. 321 N. Robertson Blvd. (310)271-6300. Click here for OpenTable. Jar is holding Passover seders on Friday, April 3 and Saturday, April 4, with seating at 5:30 p.m. They also will have one on Guests will enjoy an appetizer of house-cured salmon and chopped liver, followed by a first course of matzo ball soup in lemongrass broth, asparagus and spring radish salad and hard cooked eggs. The main course will include Jar’s signature pot roast with carrots, caramelized onions and fingerling potatoes; sautéed Alaskan halibut; and fava bean, scallion butter and horseradish mashed potatoes. Assorted macaroons and chocolate eminence lemon cheesecake will be served for dessert. The seder, led by Rabbi Ellen Nemhauser, is $130 for adults and $65 for children ages 12 and under. The price includes tax and gratuity, house wine, coffee or tea. 8225 Beverly Blvd. (323)655-6566. Click here for OpenTable. Mud Hen Tavern is offering a special Passover dinner menu beginning on Saturday, April 4 at 5 p.m. for $45 per person. Diners can start with the house-cured gravlax plate with fava beans, horseradish sauce, marinated beets and caraway matzo, or a vegetarian version made with shaved marinated cucumber. Guests can also enjoy deviled eggs and parsley leaf and apple salad with pickled mustard seed and honey vinaigrette. The slow cooked Moroccan spiced lamb shoulder is served with carrot salad in harissa and lemon, and a vegetarian option is available with roasted cauliflower steaks in Moroccan spices. Black Forest matzo brownies will be served for dessert. 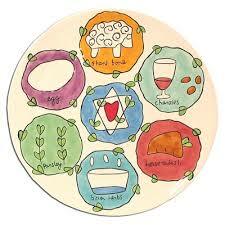 Pre-order seder plates are available for $15 and include matzo, charoset, eggs and salt water. Items from the full regular menu are available. 742 Highland Ave. (323)203-0500. Click here for OpenTable. Spago Beverly Hills will host its 31st annual Passover seder dinner on Saturday, April 4 beginning at 5:30 pm. 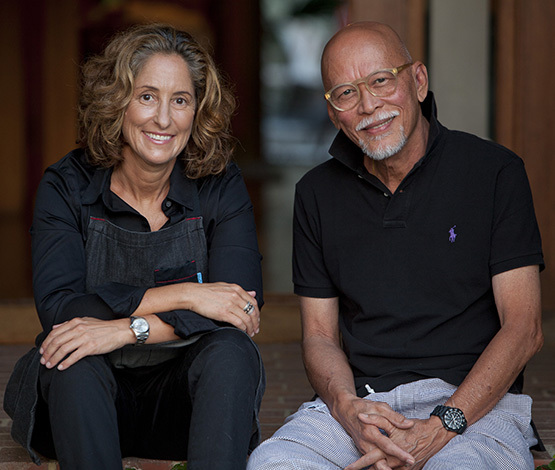 Restaurant co-founder Barbara Lazaroff began the tradition at the original Spago Hollywood to bring members of the Jewish community together on the festive holiday, as well as guests of different faiths. The meal will be led by Rabbi Arnold Rachlis and Cantor Ruti Briar, from University Synagogue. A portion of the proceeds will benefit the nonprofit, Mazon: A Jewish Response to Hunger. The cost is $190 for adults and $85 for children under 9 years old. 176 N. Canon Drive. (310)385-0880. Click here for OpenTable. Starting April 3rd through April 11th at Fleming’s Beverly Hills, start with either the Fleming’s Matzah Ball Soup or Fleming’s Salad with candied walnuts, dried cranberries, tomatoes, onions. Next select an entree of either a sliced herb-roasted filet of salmon piccata. Sides include a choice of Thai green beans or truffled mashed potatoes. Finish with a rich chocolate cake with a molten center of Belgian chocolate, served with vanilla ice cream and roasted pistachios. All for $60 per person. 252 N. Beverly Drive, Beverly Hills, (310)278-8710. Open Table.